MONON operated diesels in Purdue and Indiana University school colors. 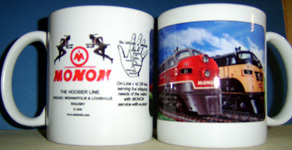 MONON was a proud road to the end, when merged into the L&N and is now part of the CSX Railroad Family. MONON is an Indian word for Swiftly Running. 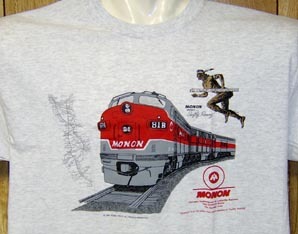 Heritage T-shirt featuring logo and F-Unit diesel of the MONON Railroad, the Hoosier Line. Their red and grey scheme was mainly used in passenger service. The MONON Railroads gorgeous red and grey passenger colors along side black and gold freight color diesels. 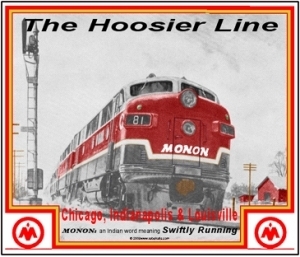 The word MONON is an Indian word meaning swiftly running. 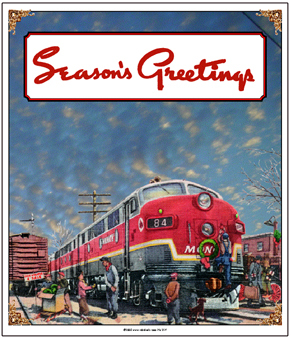 The MONON Railroad passenger train plowing through an Indiana winter storm. 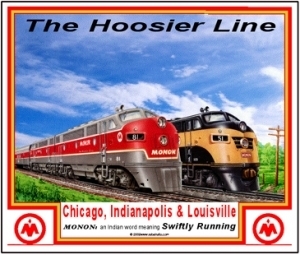 The word MONON is an Indian word meaning swiftly running. 6 inch x 6 inch square tin MONON Hand logo sign of MONON Railroad. 6 inch x 6 inch square tin Hoosier logo sign of the MONON Railroad. 6 inch x 6 inch square tin red logo sign of the MONON Railroad. 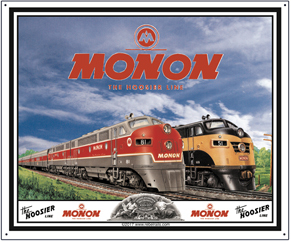 6 inch x 6 inch square tin Monon Special logo sign of the Monon Railroad. 6 inch x 6 inch square tin Tippecanoe logo sign of the Monon Railroad. Colorful pad with two MONON diesels. A red/grey passenger train and a black and gold freight diesel. Colorful pad with a MONON passenger train plowing through the snow across the Indiana heartland. 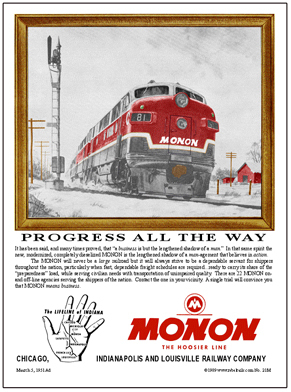 Nostalgic sign of two beautiful MONON diesels in passenger and freight colors with several MONON logos and the MONON Stock Certificate image to finish off the sign. Enhanced sign of a beautiful MONON passenger train rounding a curve at speed through wintry mid-west farm land. A 1951 era sign of an historic railroad.